An excellent ceiling fan choice, when looking for a larger fan. The Hunter Stockbridge features a 70 inch blade span from tip to tip – elegance, style and … well, a large fan – bundled into one package. The Stockbridge 70-inch ceiling fan from Hunter gives classic a contemporary twist. This 3 speed Stockbridge is designed to cool large rooms like your great room, where your family spends most of its time. In a traditional style and New Bronze finish with a snowflake scavo glass light bowl it blends seamlessly with any decor. Freshen its look to match a new decorating scheme by reversing the five blades from Walnut to Medium Oak. It’s equipped with Hunter’s patented anti-vibration technology and a unique triangular hanger ball system making it easy to install. The AVT system reduces torque for wobble-free performance while the Whisper Wind high performance motor delivers ultra powerful air movement and ensures quiet operation. An Installer’s Choice three-position mounting system allows this fan to mounted flush, standard, or angled. The Stockbridge can also be installed with or without the light and uses two candelabra bulbs (included). Offering a contemporary twist to a classic, the Hunter Stockbridge 70-inch ceiling fan (model 55042) is designed to cool large rooms like your great room, where your family spends most of its time. Transitionally styled and designer New Bronze finish and a white snowflake scavo glass light bowl, it blends seamlessly with any decor. Freshen its look to match a new decorating scheme by reversing the five blades from walnut to medium oak. The ceiling fan’s Installer’s Choice three-position mounting system allows for hanging the fan in a standard, flush, or angled position. 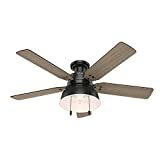 Even more, the ceiling fan’s WhisperWind motor helps ensure quiet performance and smooth-running operation. It uses two 60-watt candelabra base incandescent bulbs (included). The Stockbridge can be installed with or without the light. This entry was posted in Ceiling fans on 2019-03-26 by Mark. 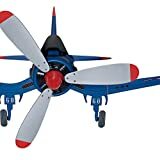 Hunter Airplane Ceiling Fan – Great for the kids! If you’ve got little ones running around in the house – or even older people in the home who like the idea of an airplane, or warplane ceiling fan – you should check these out! Hunter’s got a selection of ceiling fans that resemble airplanes. They still do a great job of moving air around – the airplane design is mostly cosmetic. Hunter’s got an assortment of different airplane style fans as well. Which one do you think is best? Leave a comment to let us know your favorite Hunter airplane fan. The aviator enthusiast in your family will be sure to appreciate the Hunter 48 in. blue ceiling fan. This ceiling fan features 3 gray blades with bright-red tips and a ceiling applique that resembles the appearance of an actual F4U Corsair fighter plane. The powerful Whisper Wind motor offers quiet operation with 3-speed control and a reverse airflow option. 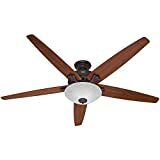 The Low Profile design of this ceiling fan accommodates mounting in rooms with low ceilings under 8 ft.
15 degree blade pitch optimized to ensure ideal air movement and peak performance. This entry was posted in Ceiling fans and tagged airplane hunter ceiling fan, fighter plane ceiling fan, hunter warplane ceiling fan on 2019-03-20 by Mark. Hunter ceiling fans are known for being a quiet brand – a safe bet, and a good choice if you are looking for a quiet fan for your home. Whether you’re a home owner, business owner, or other form of landlord, a quiet fan is a usual commodity that many search for. Hunter is well known for providing quiet ceiling fans. Part of this capability to remain quiet is the Whisperwind motor functions. Some enthusiasts ask the question – well, if the fan is super quiet, does it still do a good job on moving air? The answer to this is yes. Hunter fans do not only a great job of being quiet, but they still do a good job as what they’ve been built for too – to help move air around the room. You can use your Hunter fan in the winter, or in the summer, by changing the setting from clockwise to counter-clockwise and vica versa. What Hunter fan should I choose? Industrial and Rustic design come together on the mill Valley with details including vintage style rivets securing the blades, coin-edge thumb screws and a barn style open hood light. Style meets performance with the mill valley’s white hood reflector that maximizes light from a vintage style LED Edison bulb. Damp rated and offered in a black housing finish, the mill Valley will add a modern essence to your casual Farmhouse living spaces and patios. The flushed mount makes this Fan perfect for rooms with lower ceilings. This entry was posted in Ceiling fans and tagged hunter ceiling fan with light, quiet hunter ceiling fans, quiet whisperwind ceiling fan motor on 2019-03-20 by Mark.